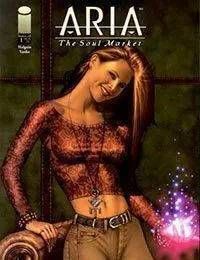 The next chapter in this series begins with the release of Aria: The Soul Market. The world of Kildare, expatriate princess of Faerie and star of Aria, gets turned upside down when Goodfellow, the deadly, mischievous sprite immortalized in Shakespeares Midsummer Nights Dream, comes to New York. Convinced that Goodfellows intentions are considerably less than pure, Kildare sifts through his trail of riddles and lies, trying to figure out just what is he is up to. Her search leads to an underground soul market, where the immortal spirits of humans are bought, sold and traded -- and to, the memory of Kildares long forgotten love. Meanwhile, Kildares friend Ondine becomes obsessed with her own lack of a soul and becomes determined to gain one at any cost.